Here’s the situation in a nutshell: Kiev is sending poorly trained, fresh recruits into battle. They are shelling civilian areas (e.g., Gorlovka) but not providing cover, recon, or reinforcements to the men actually doing the fighting against the NAF. 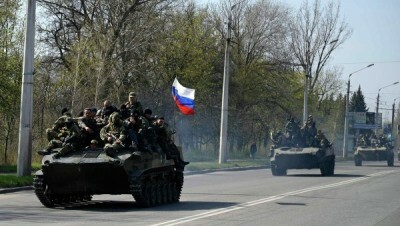 And the Novorossiyans are repelling whatever is thrown at them, taking out entire tank companies. Kiev’s troops basically have two options: surrender or die. Here a few highlights from the last couple days. First, a Ukrainian unit was sent to the Donetsk Airport with instructions to transport their wounded out of the terminal – thinking their forces still controlled it. This is the same terminal that has been under the control of Donetsk battalions for a week. Only upon encountering “Givi’s” ambush did they realize they’d been sent like lambs to the slaughter, probably as a distraction in order for tanks to encircle the airport – tanks that were destroyed by Donetsk forces. As J. Hawk writes for Fort Russ, “It’s one thing for Kiev TV stations to continue claiming the airport is held by Ukrainian formations. It’s something else altogether for local commanders to not know what the situation on the ground is.” The video below of Givi and Motorola with the POWs is priceless. The bald one is Colonel Oleg Mikats, commander of the 93rd Brigade (here’s an article with a link to him threatening to personally kill any journalists he sees in the village of Sands). This is the same surly man visible in the video of Motorola’s infamous handshake with the ‘commander’ of the 93rd Brigade, callsign “Kupol”, back in December. Motorola, injured, had been ordered to meet with the Ukrainians in control of the terminal at the time in order to effect a troop rotation for the Ukrainians holed up in the New Terminal, monitored by the OSCE. (Was Kupol really the commander? He’s clearly taking orders for Mikats in the video. It’s possible Kupol was replaced by Mikats – the handshake prompted soldiers of the 93rd to sign a petition to remove Kupol from his post for sullying his pure Ukrainian hands by touching the “bandit” Motorola.) You can watch the video of the ‘dirty handshake’ here. 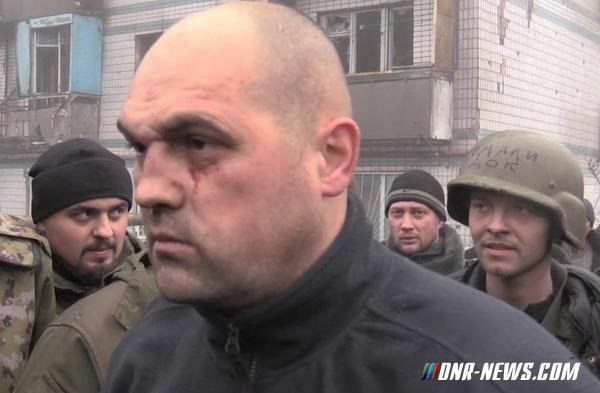 Here’s Mikats the ‘negotiator’ from that encounter, in the red circle. Esteemed Mr. President, I summoned you to the airport. There is a certain distance from the airport to Kiev, but from Peski the distance is shorter. I will summon you again from Peski. Every time we take a new town I will tell you how many kilometers to your residence. I don’t know how long this continue, but our meeting will take place, I promise you that. Now Poroshenko is between a rock and a hard place: continue sending out his troops as cannon fodder, or negotiate a real ceasefire, in which case he will be at the mercy of the “true patriots” (i.e., Nazis) that want war, war, and more war.